This article represents the recommended folder structure that you would want to create/adopt for your next Angular App. Please feel free to comment/suggest if I missed to mention one or more important points. Also, sorry for the typos. Important point to note is that one or more of the above components such as directives, filters etc could have multiple different versions and thus, the folder structure need to take care of placing different versions in different folders. Top-level “app” folder: All angular files should be placed within a folder that could be named as “app”. “App” is the top-level folder. app/components folder: One or more components can be placed within “app/components” folder. If this is a large app where there may be multiple versions of components such as directives, you may decide to segregate these components by version. Thus, the folder structure would look like “app/components/version”. For example, “app/components/1.0″, “app/components/1.1″, “app/components/2.0″. Unit tests for these components could be placed within a sub-folder called as “tests” or placed within the same folder. However, It may be good idea to place it within sub-folder. <view>.html file that consists of view. At the top-level along with “app”, you could also have folder such as “e2e-tests” for consisting of e2e tests. 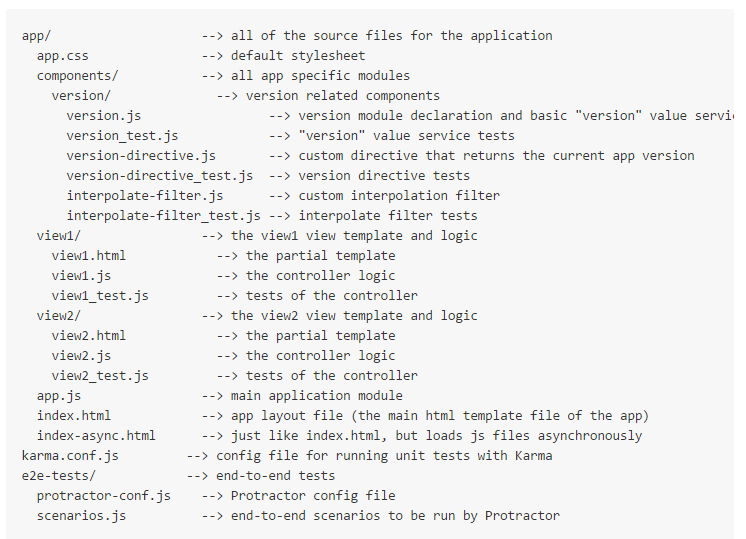 Following is the screenshot of the folder structure from taken from this angular-seed page on github. Pay attention to the description mentioned below. You may as well want to access the github page to understand in detail.